Megalodon teeth are really cool and very popular collectors items. But buying megalodon teeth can be confusing. Before you buy, probably the most important question to answer is “Why am I buying this tooth?” There are a million reasons to make a purchase, but knowing your purpose will help you make a good choice from the many types of teeth available. And it’s not all dependent upon how much you have to spend. Let’s say you’re buying a gift. If that gift is for a 6 to 10-year-old who’s already started a fossil collection, but has no example of the ancient giant shark, then try to buy the biggest tooth your budget can handle. For a child this age, bigger IS better. Quality is less important. When divers find shark teeth, chances are fairly good that they will eventually find whole teeth, but the quality of the tooth is what causes the price to soar. Don’t get me wrong, whole teeth almost always cost more than partial teeth, but a whole tooth whose edges are chipped or that has big chunks of the root missing can be much more affordable than the tooth that is both large and in perfect or near perfect condition. So let’s consider the partial tooth. If you shop around, you may find a 5 inch half-tooth for $25 to $30. For a 10-year-old who can imagine the rest of the tooth as well as the size of the mouth it came from, this would be a better choice than a smaller, but whole, tooth; for the 6-year-old, maybe not so much. Of course, there is a range of completeness. You can find teeth that are 75% to 90% whole. In a slightly higher price range a 3 to 4 inch tooth that has some damage but is 90% intact could also run anywhere from $30 to $90. A tooth from either category would delight a ten year old who can use his or her imagination to fill in the blanks. As the age of the gift-ee increases, the more you’ll want to look for increasing quality. The edges of the Megalodon tooth were serrated for ripping the flesh of its prey. A number of factors could wear down those serrations both before and after fossilization. So finding a tooth with good quality serrations tends to increase the price. There’s also the quality of the enamel. Once fossils are cleaned the enamel may be a variety of beautiful colors. The more complete the enamel and the more rare the color, the higher the price. If you are purchasing this tooth for yourself, the reason for the purchase becomes all the more important and the size of the tooth is less significant. As a collector, you may be seeking a tooth from a particular local or a tooth from a certain part of the jaw. You may be trying to collect a full set of jaw teeth, so the quality needs to be good, but perhaps that is not the most important consideration. You may be looking for a specific size tooth that would have fit in the center of the bottom jaw or the front of the top. For many collectors Megalodon teeth are well worth the expense. In addition to the enjoyment of seeing the tooth on display, it can be a good investment. 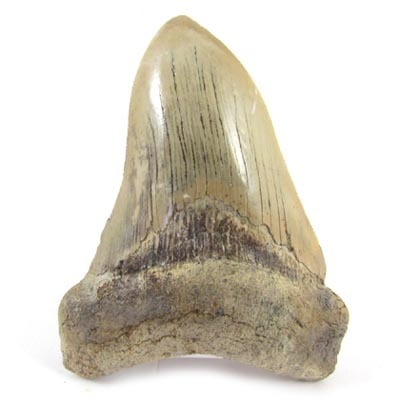 Like any collectible, Megalodon teeth tend to go up in value as availability decreases. Every year at fossil shows, we hear more stories of the difficulty divers are having in their quest for fossil Meg teeth. In time, this ancient shark will likely become as difficult to come by as the pearlized ammonites from Madagascar or the small fossil ammonities from Morocco. But that is another story!